Here at Crane Garden Buildings, we understand that securing a garden shed is both a need and a priority for many of our customers. Garden sheds are used to store everything from expensive machinery and equipment to bicycles, furniture and just about anything else. We appreciate that adding external storage to your property runs the risk of easy access and entry, and that’s why we offer the invaluable service of adding a security pack to both our Superior Sheds and Garages. Our packs add three essential elements to the buildings and allow for peace of mind. They act as the ultimate deterrent and protection against any unwanted visitors and are the well-researched result of over 40 years’ experience with garden sheds. So, what do our security packs consist of? And why are they the ultimate solution in the quest to securing your garden shed? We work closely with the manufacturers of our heavy-duty, 7-lever lock to constantly improve and update their quality. 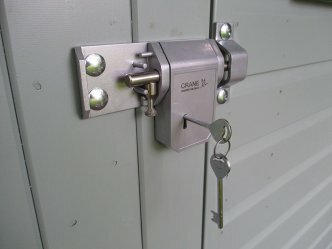 We introduced these locks as an optional extra with our sheds in 1994 and as a result have dramatically reduced the level of theft experienced by shed owners who buy from Crane Garden Buildings. The lock itself features a heavy-duty sliding bolt with a fully-encased 7 lever lock. It is resistant to sawing, picking, cropping and prising with a unique key set. Any windows you choose to have in your Superior Shed or Garage will feature stainless-steel bars that are mortised into the window frame during manufacture. Our customers also have the choice of either fixed or opening windows which gives them the freedom to asses their requirements and make an appropriate decision based on their needs. 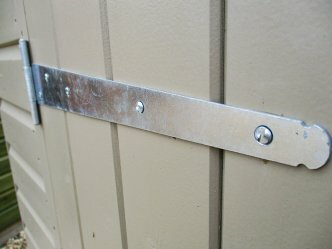 In the past, and still with a lot of buildings currently in the market, it has been easy for vandals and burglars to unscrew the hinges on doors making for easy access into the interior of sheds and garages alike. That is why our security packs contain screws on our door hinges that cannot be unscrewed or tampered with. What else can Crane do for you? As part of our exceptional service and knowledgeable expertise, we are able to assist you with other elements of making your garden shed secure. For example, you may have already purchased a motion-sensor security light you wish to fix to the exterior of the building, which our fitting team can add. You may also want to consider our electric pack, which will allow you to add internal alarms, cameras and further lighting yourself after installation.